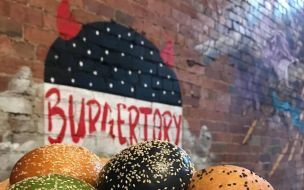 Burgertory is the result of a battle that occurred early in 2017, a battle most of mankind was oblivious to. What had started out as a debate between Archangel Michael and Lucifer as to who had the better food, soon erupted into a war of two worlds. Michael swore by only pure and natural ingredients, whilst Lucifer chuckled and only believed in cheese, cheese and more cheese! After months of battle and war between these two worlds, Lucifer decided to end this once and for all… He summoned all his mischievous minions to build him a bacon-covered pitchfork. As Lucifer threw his bacon-covered pitchfork towards Earth, Archangel Michael propelled a lettuce lightning bolt to protect Earth from forever being covered in nutritionally empty food. The two edible artilleries collided causing a storm like Earth had never seen before. Late August 2017, after the dust had settled, a new world was born. The one we know today as Burgertory. Burgertory opens its doors in September 2017, welcoming those seeking the best of both worlds. Bringing heavenly freshness and quality fit for gods, with a touch of Lucifers cheekiness. Burgertory is the place to seek refuge for those stuck between two worlds.